Margaret Tudor lived from 28 November 1489 to 18 October 1541. She was the daughter of Henry VII of England and the sister of Henry VIII; the wife of James IV of Scotland and the mother of James V. And, perhaps most crucially, it was her wedding that led to the unification of the Crowns of England and Scotland in 1603 by James VI/I, the son of two of Margaret Tudor's grandchildren. The wider picture in Scotland at the time is set out in our Historical Timeline. It has been said that fate intended Margaret to be Queen of Scots. Born on 29 November 1489, she was christened on the 30th, St Andrew's Day, in St Margaret's Church, Westminster, dedicated to Scotland's only royal saint. By the time Margaret was six, her father had already floated the idea of a marriage with James IV as a means of reducing Scottish support for Perkin Warbeck, the Yorkist pretender to the throne of England. Henry overruled English opposition to bringing the House of Stewart into the succession for the English crown, noting prophetically: "our realme wald receive na damage thair thorow, for in that caise Ingland wald not accress unto Scotland, bot Scotland wald acress unto Ingland, as to the most noble heid of the hole yle.."
On 24 January 1502, Scotland and England concluded the Treaty of Perpetual Peace, between them, to be guaranteed by the parallel marriage treaty agreed between James and Margaret. The marriage took place on 8 August 1503 at Holyrood Abbey in Edinburgh. After three childred died in infancy, their first surviving son, James, was born in April 1512, and their second, Alexander, Earl of Ross was born in April 1514. But by then Margaret was a widow and her first son was already James V of Scotland. In 1509 Henry VII of England had been succeeded by Margaret's brother, Henry VIII, whose aggressive stance towards France led inevitably to war. 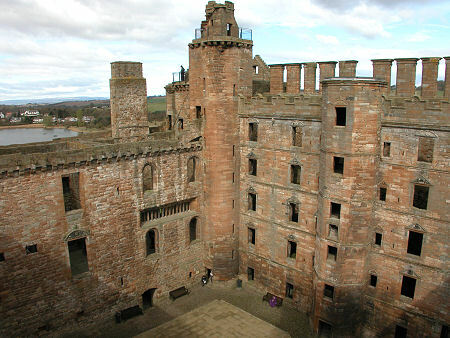 Scotland and France had a long-standing mutual assistance treaty, the Auld Alliance, so in 1513, James IV left Margaret, bitterly opposed to the war, at Linlithgow Palace, and led a Scottish army south into England. The outcome, on 9 September 1513, was the worst military disaster in Scottish history, the Battle of Flodden, in which an entire generation of Scottish nobility, including James IV, was wiped out. James IV's will appointed Margaret as Regent for the young James V unless she remarried, and the Privy Council reluctantly agreed: so at the age of 24, Margaret found herself a pregnant, widowed young mother, trying to rule a Scotland reeling in the aftermath of a crushing defeat at the hands of her brother's English army. By the middle of 1514, Margaret had just about gained control of the most important factions threatening to rip Scotland apart, and fended off calls for her to be replaced as Regent by James V's uncle, John Stewart, 2nd Duke of Albany. However, on 6 August 1514, in a move that remarkably foreshadowed the start of the fall from power of her granddaughter, Mary Queen of Scots, Margaret secretly married Archibald Douglas, 6th Earl of Angus, described even by his own uncle as a "young, witless fool". By doing so she forfeited the Regency under the terms of James IV's will, and in September 1514 the Privy Council appointed the Duke of Albany, then resident in France, as Regent. The Duke of Albany returned to Scotland in May 1515 and was formally made Regent in July that year. Margaret, meanwhile, was holed up in Stirling Castle with her sons, only surrendering them to Albany in August after what amounted to a genteel siege. By now pregnant with the Earl of Angus's child, Margaret Tudor fled to England. In October she gave birth to Margaret Douglas, the future Countess of Lennox and mother of Henry Stuart, Lord Darnley, one day to be the second husband of Mary Queen of Scots, Margaret Tudor's granddaughter via James V.
While in England, Margaret heard the news of the death of her young son, Alexander, Earl of Ross: probably by natural causes, although her husband tried to convince her that the Duke of Albany was to blame. In 1517 she returned to Scotland where she discovered that in her absence her feckless new husband had been living with a former lover, Lady Jane Stewart, and using Margaret's money to do so. When the Duke of Albany returned - again - to Scotland in 1521 after spending three years in France, Margaret formed a close alliance with him. This lasted until 1524, when Margaret mounted a coup d'état that saw Albany deposed as Regent, fleeing again to France. The 12 year old James V was brought from Stirling to Edinburgh to great popular acclaim to take up his personal rule: under the continuing close guidance of his mother. At about the same time, Margaret formed an attachment with Henry Stewart, a younger brother of Lord Avondale. In November 1524 Margaret's husband, the Earl of Angus arrived in Edinburgh with a large group of armed men, claiming that he had a right to attend Parliament. Margaret ordered the cannons at Edinburgh Castle and Holyrood House to open fire on him. The Earl of Angus did subsequently regain a foothold in Scottish society, and then used it to keep James V a virtual prisoner for three years. March 1527 Pope Clement VII granted Margaret's request for a divorce from the Earl of Angus, and when she heard of it in December that year she rapidly married Henry Stewart. In June 1528, James V was finally able to exercise real power, and he appointed his mother and her third husband, now titled Lord Methven, as senior advisers. Lord Methven proved even more partial to his wife's money and other women's company than the Earl of Angus had done, but Margaret was unsuccessful in either retiring to England or obtaining a second divorce. From 1538, Margaret, finally reconciled with Lord Methven, formed a close bond with her new daughter-in-law, Marie de Guise, the French Queen of James V. She continued to play an active part in court life until her death from a severe stroke at Methven Castle, Perthshire on 18 October 1541. The parallels between the life of Margaret Tudor and the life of her granddaughter Mary Queen of Scots are uncanny. Both married foreign kings before becoming very young widows. Both married unwisely twice more. And both even married someone called Henry Stewart. Yet it says much for Margaret's ability and determination that while her granddaughter held the reigns of power in Scotland for just six years, Margaret herself did so, in one form or another, for the better part of three decades.